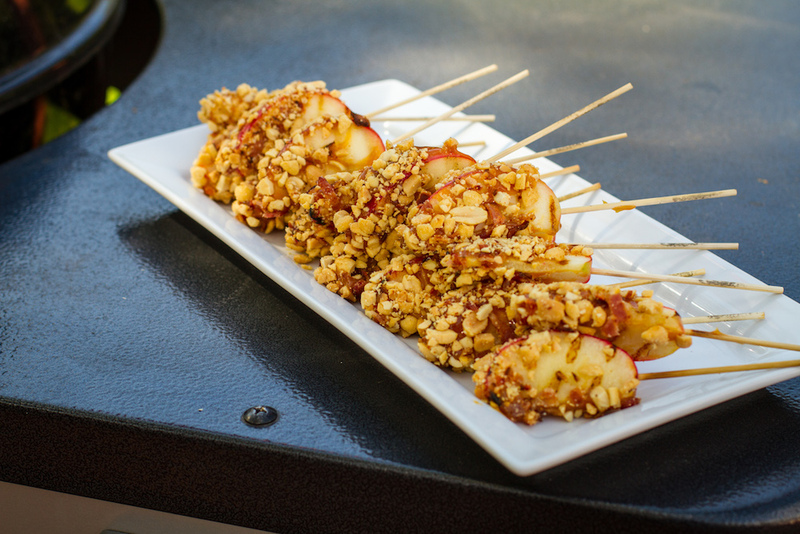 I have a passion for apple season and this recipe was inspired by the Autumn classic, the caramel apple on a stick. I wondered, if you combined the classic flavors of the caramel apple with my two personal favorites, bourbon and bacon, could this be a real winner? Remember to use a crisp, crunchy apple for best results! 1. Cook the bacon in a pan with medium heat until the fat is rendered and the bacon has browned. Cool the bacon on paper towels and chop into small pieces. 2. Cut each apple into 8 wedges, then cut the core from each apple. Toss the apple slices in a little lemon juice and the bourbon. Skewer each apple with the bamboo skewer. 3. 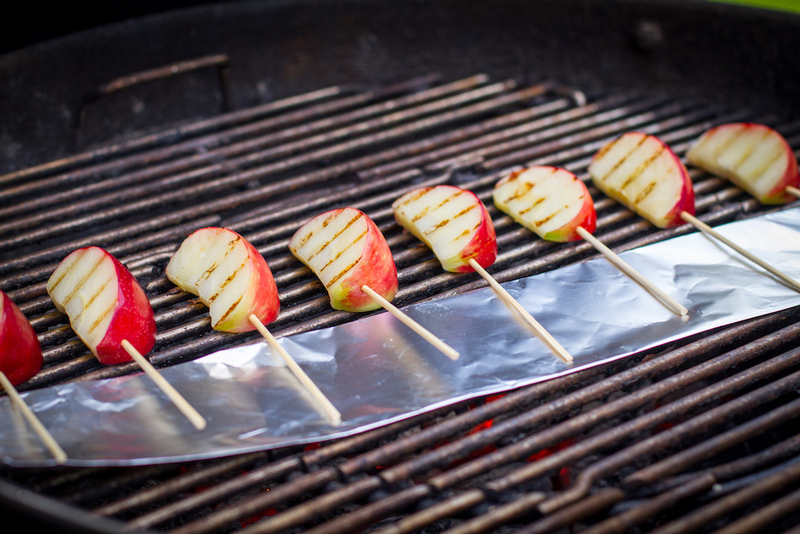 Once the apples have been skewered, set the grill for direct, medium heat grilling. When the grill is set, line the grill with a foil strip to create a safe zone, so the bamboo doesn’t burn up. Grill the apple wedges for one minute, then turn them and grill for another minute. 4. After grilling, remove to a pan and allow to cool for a few minutes. Mix the chopped nuts and cooked bacon on a plate. 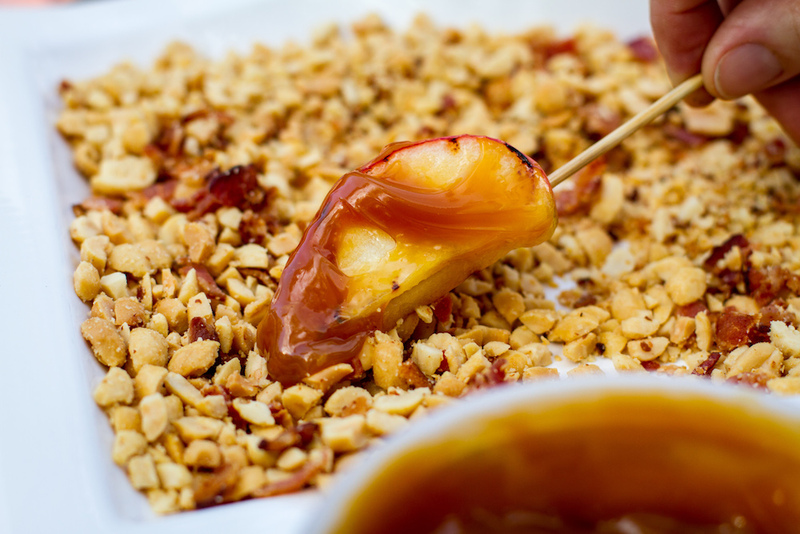 Once the apples have cooled, dip in the caramel sauce, then roll in the chopped nuts and bacon.